Interesting. 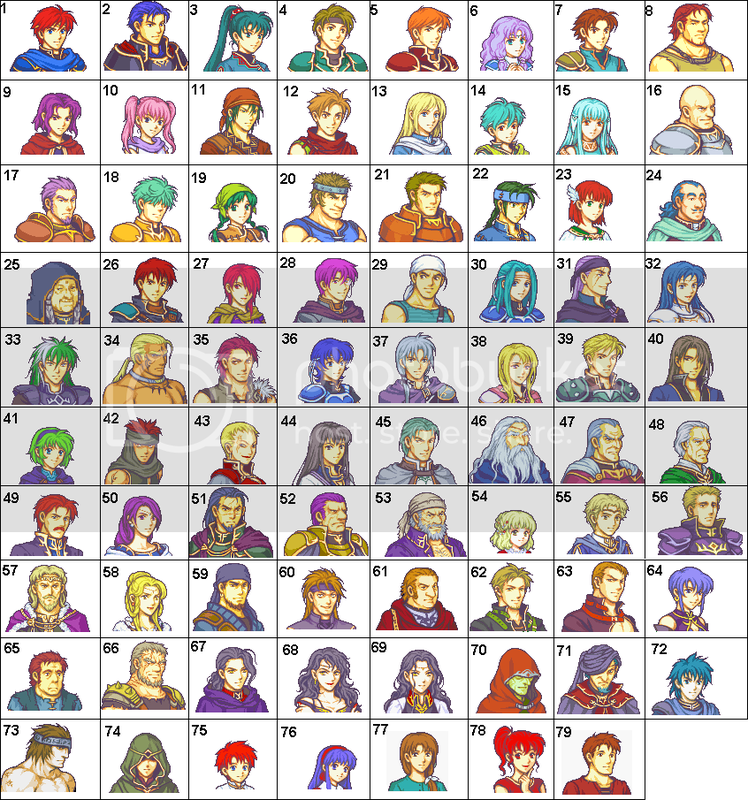 These portraits are largely based on the Nintendo DS Fire Emblem style (see e.g. ), which employs pretty minimal lighting. My general impression is that these portraits are made with the assumption that the characters are outdoors in a sunlit setting, where strong directional lighting makes a bit less sense--but I could actually see a directionally lit variation for dimly lit indoor (or underground) settings being handy. I might leave it up to the mod community to make those variations, though, since we have a pretty huge number of portraits to get through. Hm. Yeah, I think I see where you're going with this. 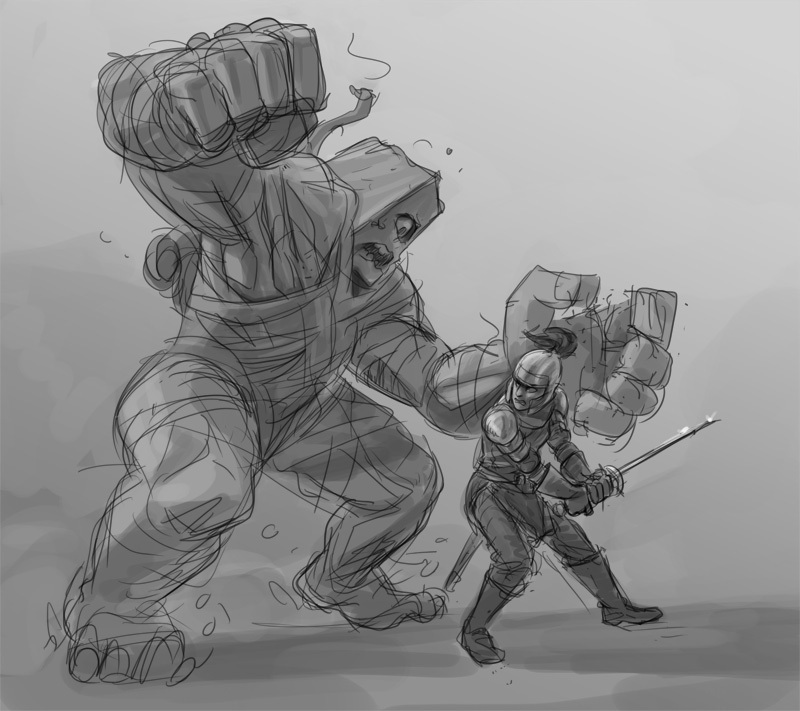 I should probably hold off on critiquing till I see this stuff in-game -- context is everything, and what makes sense for a single image won't necessarily work when it has to work in a dozen different places. I'll trust your artist knows his stuff. 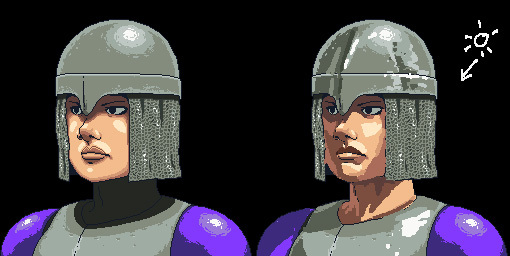 I like the portraits, but I think they'd benefit from a stronger directional light-source. Don't be afraid to stick the darkest and lightest spots next to each other either, especially with metallic objects. Hope I didn't step on anyone's toes by posting this, I actually think the portraits are great: solid anatomy and lots of character and the lizard dudes are pure awesome. The lighting could just use a little love . Thanks a ton! I really appreciate the feedback. God, that interface. I've already revised the interface quite a few times now based on player feedback; I'm starting to think it's just one of those things where no one is ever going to agree on an ideal solution! A lot of people were like you, and liked the old "pop up buttons by the character" method, but a lot of others didn't like that the buttons weren't always in a consistent place on the screen using that method. So you have the current window, which lets you drag it wherever, but always appears in the same place on the screen. Maybe I'll add an option to the game to have it just auto-position under the current character whenever selecting actions? I'll have to give it more thought. Anyway, I appreciate the thoughtful feedback, and am looking forward to finishing this game up for you. Yeah, you're never going to please everyone. The solution you posted sounds like a good compromise though, I'm sure you'll come up with something that works. I pretty much went straight from the demo to pledging on Kickstarter. Even at this early stage the game-play feels very solid. The deterministic combat is great, and I really like how important positioning is. My favorite thing, however, is probably the shove/pull mechanic: for example, in the last map of the demo I had one of my units pull the archers off the tower with her mind. It was awesome, and, importantly, made me feel like I there were more ways to win then just sending my units up to stab the enemy in the face. The engineer likewise is a lot of fun, as it opens up the possibility of building barriers to funnel the enemy into a spot you can take advantage of. I hope you'll be keeping this stuff in mind designing the maps--I see a lot of potential to give people creative paths to victory. Also, as a color-blind player, thank you thank you thank you for adding shapes to show which side a unit is on instead of just using a different color. I wish more developers did that. The interface didn't win me over as much as the core mechanics did, and I'd like to hear a bit more about your plans for it. Specifically, I think context-sensitive clicks are sorely needed. For example, clicking on an enemy unit could bring up a menu of available attacks (if said enemy is in range), moving on top of a tile with a bag in it might automatically pick it up, clicking on an open tile could just move you there. Clicking on a button for every action works fine, but you could probably streamline things to the point where the menu-bar isn't even required. I also kind of liked the look of having buttons pop up on selected units rather then on a fixed bar, like in some of your old videos, although I'm sure you had a good reason for changing direction on that. Granted, I'm no game designer, so take my ramblings with the usual grain of salt. Great game though! Can't wait to get the final version, and I'm glad the Kickstarter is going so well.